Submitted by thedoughycoed on February 28, 2015 – 2:19pm. I’ve been lurking on this website for awhile, and decided it was finally time to woman-up and try some of the techniques that I’ve seen. I started my sourdough-ing with the Rustic Sourdough from KAF, a cheaters sourdough, if you will (http://www.kingarthurflour.com/recipes/rustic-sourdough-bread-recipe). I have no elitist qualms about cheating with yeast, and I appreciate the training wheels. While we’re on the subject of my being a big fat cheater, I must admit I use citric acid to increase the tang, a la (http://www.kingarthurflour.com/recipes/extra-tangy-sourdough-bread-recipe). 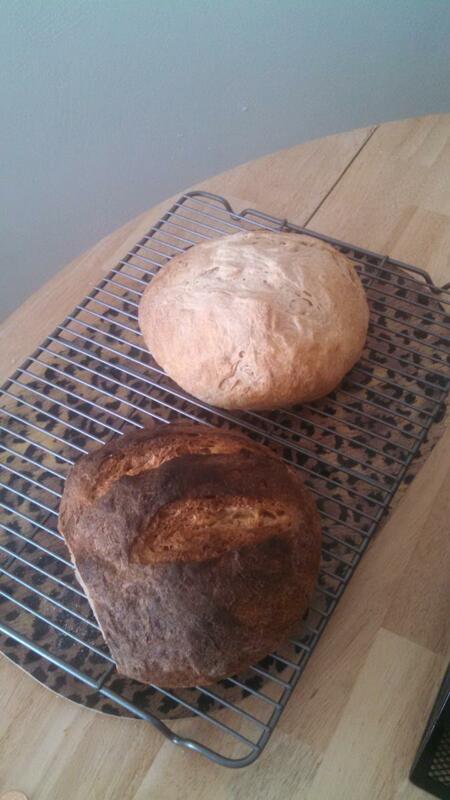 I’m a girl that loves consistency and reliability, and true sourdough can be a fickle mistress. 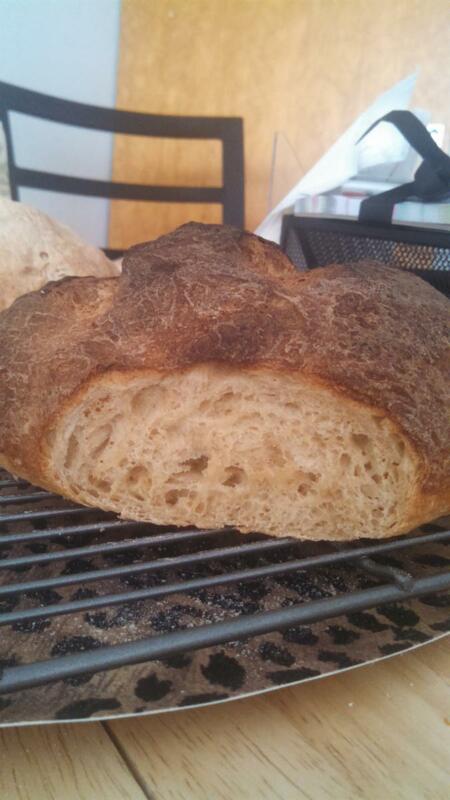 I was very happy with the crumb and the balanced flavor, so now I’m looking for more ways to improve. I mixed this dough with a wooden spoon, but I’ll try it with my food processor next time, as I noticed plenty of lumps during the stretch and folds. Ice cubes in the oven were a rather cumbersome steam method, but I’m sure I can find a better one around here. The loaf baked on a stone in the top half of the oven became far browner than the loaf baked on a jelly roll pan in the bottom of the oven, but I’m not sure how to remedy that. Does anyone have additional guidance? « Soaker benefits with whole grain?